Enjoy and please share with us how you and your family enjoy this cookbook! 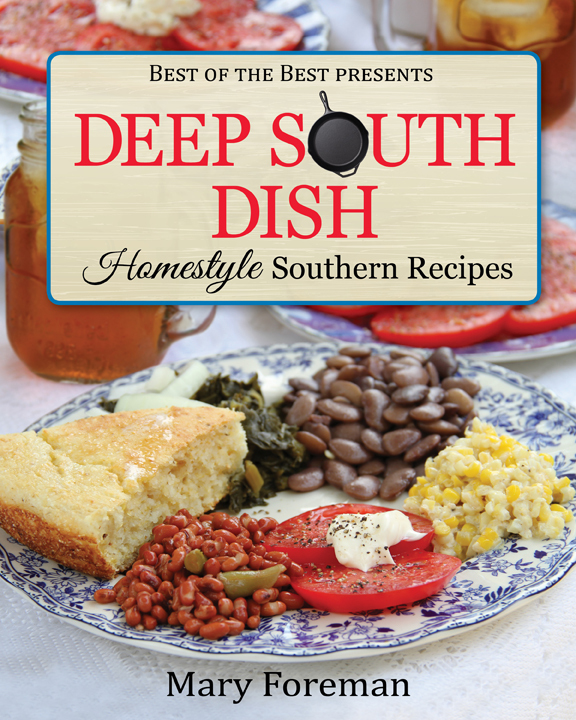 I was thrilled when I was asked to do a cookbook review and a giveaway on Deep South Dish - Homestyle Southern Recipes by Mary Foreman. I adore southern food, so I was so excited when the cookbook came and I got to dig in and start reading and trying recipes. Most of the southern cookbooks I own are from the Carolina area. Mary of Deep South Dish is from the Mississippi Gulf Coast. It was interesting to this midwest girl to see the differences in cooking. Some of the differences were in ingredients, yet what surprised me most is the preparation methods being different in others. Whether it is a regional difference, or Mary's style, I like it! The more new twists I saw, the more I kept reading to see what her spin was on other recipes. 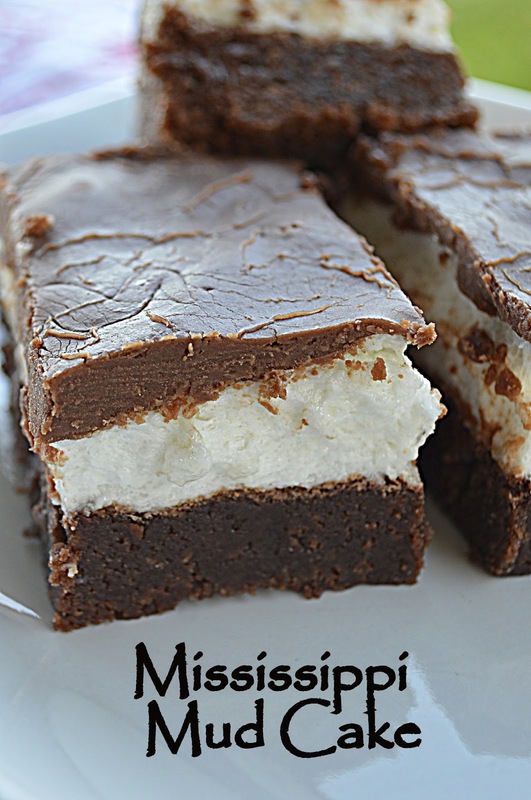 In addition to being a cookbook author, Mary also blogs over at Deep South Dish. Mary's readers know that she is always bringing something delicious to the table. Her ingredients are easy to obtain for the most part. For some reason, here in rural Wisconsin, I can not find a decent cajun seasoning, so I have that on my shopping list for my trip to the "cities" in two weeks. Once I have that, there a whole other list of recipes I will be trying. One thing I don't make a lot of at home is dishes with the whole chicken, because I just don't feel that I am good at them. So, when I found Southern-Style Baked Chicken (Page 130) in the cookbook, I knew I had to at least try it. Guess what? It rocked! First decent "whole" "bone-in" chicken I have made outside of the crockpot. Next up was Grandma Mac's Southern Pound Cake (Page 200). So amazing! 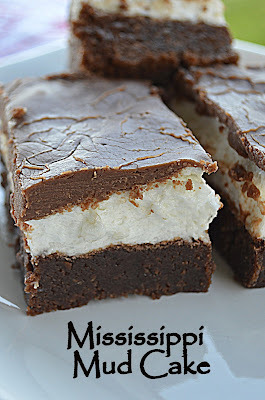 Ooh and the Mississippi Mud Cake (Page 204). I didn't have pecans in the house the day I made this, but still.... Amazing! 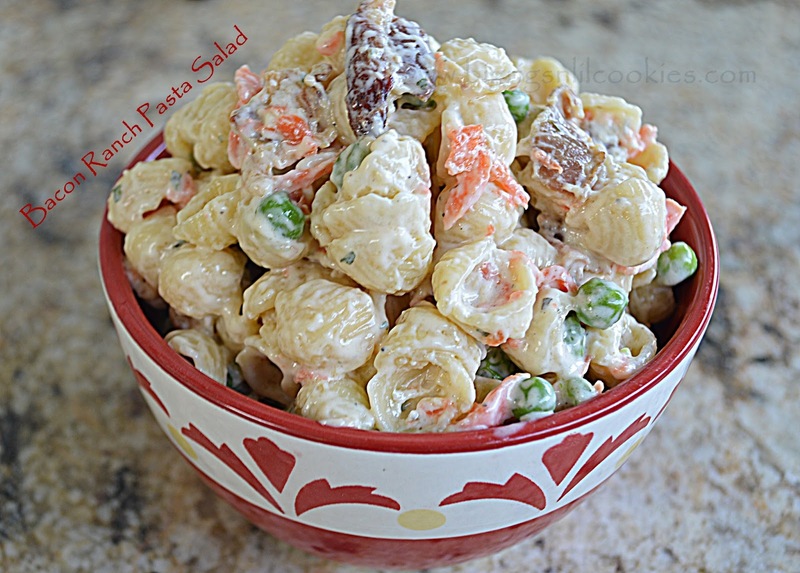 The recipe I want to share with you today is Mary's Bacon Ranch Pasta Salad. This is going to be my new go-to pasta salad. Simple and Flavorful. To order a copy of Deep South Dish - Homestyle Southern Recipes by Mary Foreman, visit Amazon here. To WIN your very own copy, leave a comment here telling me your favorite southern food, with your email address If you have never made a southern dish, just tell me your all time favorite food. That works too. For an additional entry, comment on this link on my facebook page. Winner: I will randomly choose a winner and announce it at the top of this post, and on facebook. The winner will also be notified via email; if the winner does not respond within 72 hours, another winner will be selected. In microwave safe bowl, lightly sprinkle grated carrot with water. Cover and cook on high for 2 minutes. Set aside to cool. Once cool, wrap the carrots inside of several paper towels, and squeeze out any liquid. Set aside. Prepare shell pasta according to package directions. Rinse and rain. Pat pasta dry with paper towels. Add pasta to serving bowl. Toss with a drizzle of olive oil. Stir in mayonnaise until well blended. Add bacon, carrots, onion powder and ranch dressing. Stir together. Add milk as needed until creamy. Add peas, stir. Cover and refrigerate over night. Disclosure: I received a free copy of this cookbook to review, and as well as one to giveaway. Love Mary and this cookbook!! The salad looks super duper yummy! My favorite southern food? So many to choose from but I love fried green tomatoes. My favorite southern food is my Momma's fried chicken and any fresh veggie from the garden. My Momma's fried chicken and any fresh veggie from the garden. I'm so glad to have found this blog from Mary's( Foreman ) fb post , I love cooking and you have a lot of good posts here ! The Country Life... You are the winner! Please message me with your mailing address! Congrats! My favorite Southern dish is macaroni and cheese. 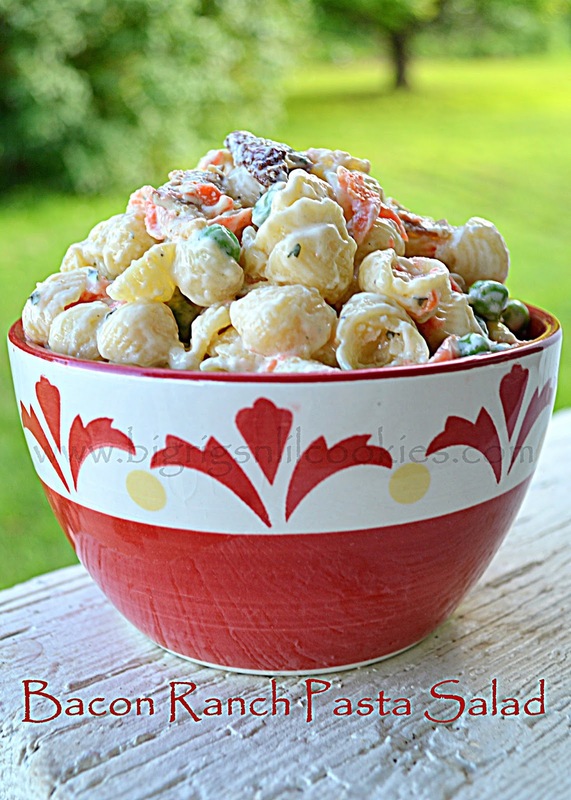 I love a good Macaroni and Cheese recipe! I'm always looking for the perfect one. Southern Fried Chicken, corn bread, peas, carrots and baked beans. Fried chicken, cornbread and succotash! Wow, that pasta looks wonderful. I am making that! I love Southern Fried Chicken. To be honest, I have not tried many Southern foods. That salad looks delicious! Yum! Like Carla, I haven't tried a lot of Southern Foods but looks worth learning more about ;)! I want a good recipe for Shrimp and Grits, like I had in Charleston, NC. Carol, you have won the cookbook! Please email me with your information so I can have it shipped to you! i love corn fritters, cannot get enough of them! and fried squash! Around here, they love to make Chocolate Gravy! YUM! Don't forget the fat back! My favorite southern food is my mothers fried chicken. Thanks for offering such a great giveaway!